The Kurdistan Islamic Union (KIU) this week successfully held its sixth national conference in the south of Kurdistan. 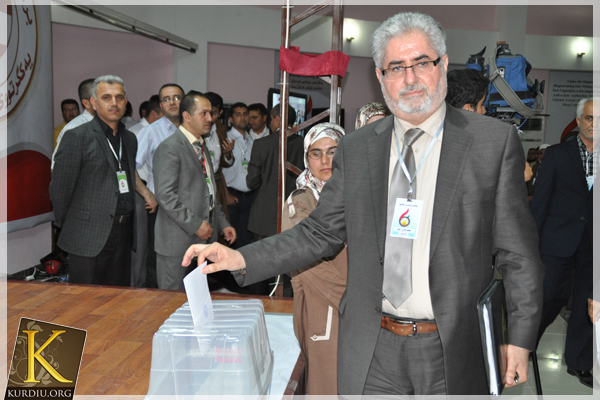 Prior to the conference, Salahadin Bahadin decided to step down as the KIU’s long-standing leader and make way for new blood – an exceptional step in the Kurdistan Region. Mohammed Faraj was elected the new KIU leader, winning two-thirds of the votes. This conference has created a new democratic model for Kurdish politics where the leaders – for example those of the ruling PUK and KDP – traditionally prefer to hang onto power indefinitely and to ‘keep it in the family’. The conference also voted for a measure to ensure a minimum of 25 per cent representation by women in local party leadership bodies. In his speech to the conference, the new leader Mohammed Faraj affirmed his commitment to work for the programme of the KIU. “This is a new era for a new movement to serve our people and our nation”, he said. Together with the Gorran Party and the Islamic League, the KIU is part of the opposition in the Kurdistan Region and it has refused invitations to participate in the current government. There had been fears that the KIU would not be able to hold its conference without disruption, especially following the recent burnings of KIU offices in Zhako and Duhok. However, the party has been protected by the public sympathy it won through its restrained response to these attacks and through Salahadin Bahadin’s salutary decision to voluntarily relinquish office. THIS is not surprising hence the KIU are really working hard from all aspect of their organization structure and leadership management.some organisation such as KDP,PUK and Gorran could not held such a conference so transparent.KIU is proved is a party for future Kurdish generation .